ARM observations shed light on the processes behind the low cloud response to warming. Lawrence Livermore National Laboratory scientists together with scientists from Colorado State University and State University of New York – Albany analyzed multiple ground-based retrievals of cloud properties to quantify how low cloud reflectivity responds to changes in temperature. They also tested whether observations support any of the mechanisms in the literature that are hypothesized to drive the reflectivity response. How cloud optical properties will respond to warming remains a large source of uncertainty in predictions of future warming. This study provides independent support from ground-based observations that reinforces previous model and satellite findings that show cloud reflectivity to increase at colder temperatures and cloud reflectivity to decrease at warmer temperatures. An analysis of the physical mechanisms driving this behavior provides a basis to assess model performance and highlights the importance of competing factors that contribute to the overall change in cloud properties with warming. Many climate models predict that the reflectivity of low-level clouds increases with warming in the middle and high latitudes. Specifically, models predict an increase in reflectivity at colder temperatures below freezing and a decrease with warming at warmer temperatures. Analysis of satellite retrievals has also found a similar relationship. Scientists at LLNL, CSU, and SUNY-Albany used cloud retrievals from the U.S. Department of Energy’s Atmospheric and Radiation Measurement (ARM) program to test whether the same relationship can also be seen in ground-based observations of low-level stratiform clouds. Indeed, optical depth retrievals from independent instruments show the same qualitative relationship, where most of the response is explained by the changes in the amount of cloud water. Furthermore, the extra-detail provided by ARM observations allowed the scientists to test whether observational evidence supports any of five mechanisms proposed in the literature to drive changes in cloud reflectivity with temperature. They found that an increase in condensed water following the adiabatic lapse rate and a shift in the cloud phase from ice to liquid both contributed to the increase in cloud water with warming. 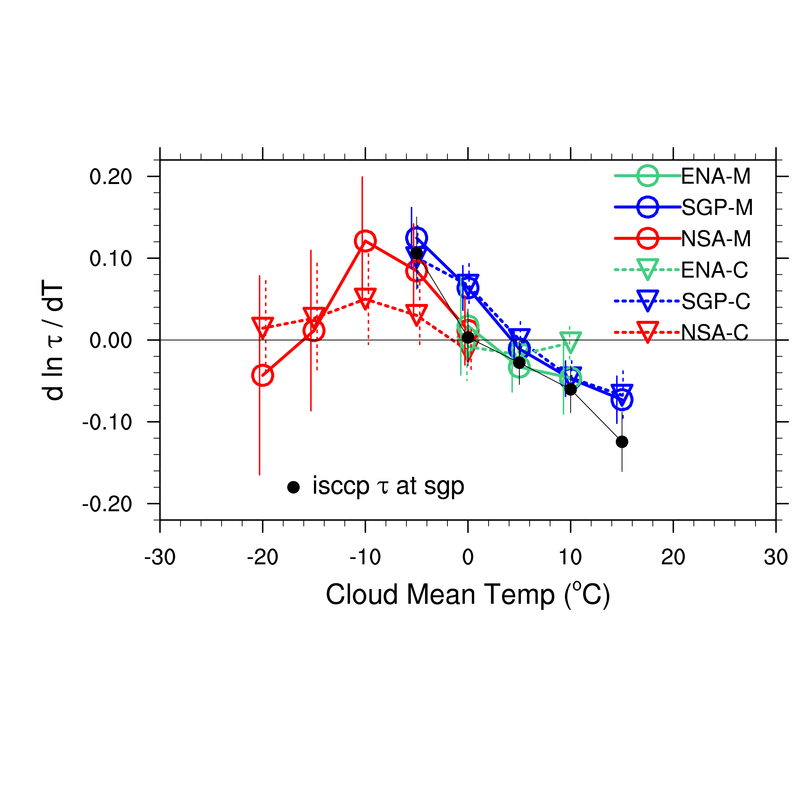 They also found that a decrease in cloud water was explained by a weakening of the cloud-top inversion and stabilization of the boundary layer. The findings and methods within this study provide a means to observationally constrain model processes that are behind the cloud response to future warming. Terai, C, Y Zhang, S Klein, M Zelinka, C Chiu, and Q Min. 2019. "Mechanisms Behind the Extratropical Stratiform Low-Cloud Optical Depth Response to Temperature in ARM Site Observations." Journal of Geophysical Research - Atmospheres 124, doi:10.1029/2018JD029359.